Coffee and tea are immensely popular drinks, which is why it is essential that coffee and tea labels are informative, accurate and pleasing to the customer eye. With customers obsessed with food consumption, it is easy to overlook the importance of accurate coffee and tea labels. However, no beverage producer wants to have unclear or inaccurate labels, as this can lead to consumer confusion. How can I print my own coffee and tea labels? 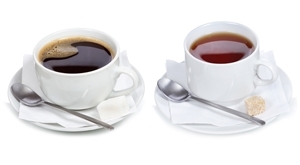 Printing coffee and tea labels in-house will not only save your company money, but time as well. Should any Food and Drug Administration (FDA) standards change, there will not be a waiting period as you send out for updated labels from a third-party printer. Using a VIPColor VP485 color label printer can help a company produce crisp images and smudge-free descriptions. Additionally, instead of wasting ink when a cartridge runs low, the VP485 simply replaces it - keeping your costs lower. Speeds are up to ten times faster than older models and ink costs are 40 percent lower. The VIPColor VP485 also prints up to 2400 x 1200 dpi at print speeds up to 5 inches per second, which guarantees that your coffee and tea labels can be more intricate and pristine. Also, by being printed on durable, water resistant stock, your labels will not smear or become illegible, regardless of transport conditions. Why use DuraFast coffee and tea labels? When your company invests in a color label printer from DuraFast Label Company, you are ensuring that the labels will be durable and eye-catching. Customers will be able to read everything from nutrition facts and ingredients to background information on where the coffee or tea originated. Contact one of our label experts today to find the right printer to create all of the coffee and tea labels you need. Once the right printer is found, your company can begin to design custom labels that are unique, colorful and durable.